Week 2 of our You Matter Marathon has us going STRONG! By our estimation we have shared at least 130,000 You Matter cards! We thank our Ambassador organizations including Del Norte High School, The Church of Scotland, and the Skyline Yellow Ribbon Club. Check out the rest here. We also added 3 more countries: Austria, Lithuania, and Nigeria to bring our total to 54. Our global community now consists of 14,267 spectacular people. Catch up on You Matter Marathon blog posts here. Click here to order more You Matter cards from Vistaprint. Use discount code TV500 and print the card on Signature Glossy cardstock. 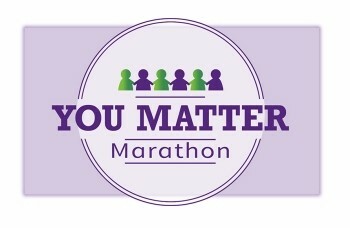 We will have an online You Matter Marathon Celebration call on December 5. You can choose from one of three times to accommodate our global community. Online calls will be at 7:00 a.m., EST, 2:00 p.m. EST, and 9:00 p.m. EST and last no more than an hour.